After the fierce competition with HD DVD, Blu-ray had become main stream for storing high definition movies. To prevent Blu-ray content from being distributed illegally, the Blu-ray region code scheme was introduced. The Blu-ray region codes are separated in three different zones. There are a few things about Blu-ray region codes you should know about before buying a Blu-ray player. One of them is that that Blu-ray region codes mean is that Blu-ray players sold in a specific region can only play Blu-ray discs that are made to be played only in that region. There are in total of 3 different regions, labeled A, B and C.
What does region free mean? Sometimes, if not most of the time, you might see a disc with all the region codes(A,B and C) on them. This indicates that the disc is region free, thus allowing you to play it on any Blu-ray player regardless of the region code on it. Different movie distributors have different attitude toward region codes. Some major U.S. movie studios like Walt Disney Pictures, Paramount Pictures, Universal Studios, Warner Bros, and Sony Pictures Entertainment have chosen to release most of their titles region-free. So that’s why you will be seeing most of their titles with all the region codes on them. And also a region free Blu-ray player can play Blu-ray discs of all regions. In some region, Blu-ray discs are sold at a lower price than other regions. And there are people who choose to buy Blu-ray discs from those regions to save money. If you buy most of your Blu-ray discs from regions that are different from the region you purchase your Blu-ray player from, then you might encounter playback issues of the discs due to the region codes on them. In situations like this, a region-free Blu-ray player would have all the problems solved. Check out several of the region-free Blu-ray players you can use to play region-locked Blu-ray discs. The Sony BDP-S6500 Blu-ray player has basically all the features you would probably expect in a high-end Blu-ray player. Other than that it’s region-free for both Blu-rays and DVDs, which is what we need, it also supports 4k upscaling. Most of the old Blu-rays are 720p or 1080p, but 4K TV is getting more and more common, so it’s a much appreciated feature for people who started collect Blu-rays years ago. The DVDs can also be upscaled to the resolution of a Blu-ray movie with high quality. It also supports playback of 3D Blu-ray discs and it does more than that. It can convert 2D Blu-ray/DVDs to 3D to play on your 3D TV. If you are looking for a region free 4K Blu-ray player, this is the one you need. You can get this high-end region free Blu-ray DVD player from Sony on Amazon for $209. 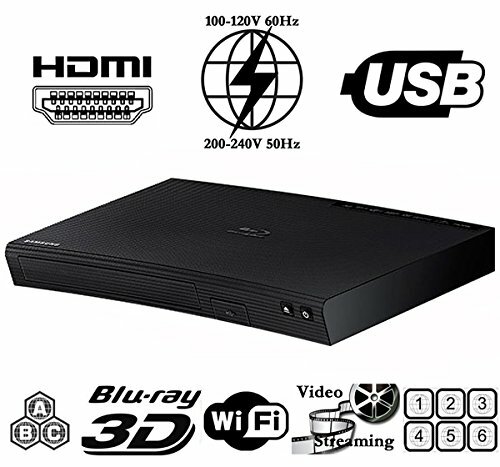 This Samsung BD-H5900 Blu-ray player is region free for both Blu-rays and DVDs. It packs the 3D Blu-ray disc playback feature for 3D TVs and 3D active shutter glasses. It also has Wi-Fi built-in that would allow you to stream content to other devices around the household. You can also stream media content from Netflix, YouTube and Pandora on it. With a DLNA-enabled device, you can easily mirror the content on your TV to your device to enjoy seamlessly. It’s priced at $179 on Amazon. 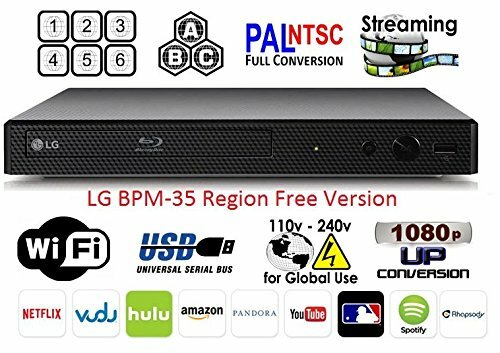 The LG BPM-35 is the cheapest one so far on our list of best region free Blu-ray players. You can get it for $148 from Amazon. It’s a region free Blu-ray/DVD player that can play Blu-rays from all regions. Other than that, it can also play music, photos and videos from USB drives. It’s something that a lot of Xbox and PlayStation owners have been doing for a long time. It also supports W-Fi which enables this region free Blu-ray player to stream media content from content providers like Netflix, Amazon Instant Video, Hulu Plus, Vudu, Pandora, YouTube, Spotify, etc. It’s a very well-rounded region free Blu-ray DVD player. If you have no plan on updating your current Blu-ray player to a region free Blu-ray player and have some Blu-ray discs that have different region codes than your player, you might want to consider making a region free copy of them. That way you can play the disc on any Blu-ray player you have and the region codes on them won’t bother you. 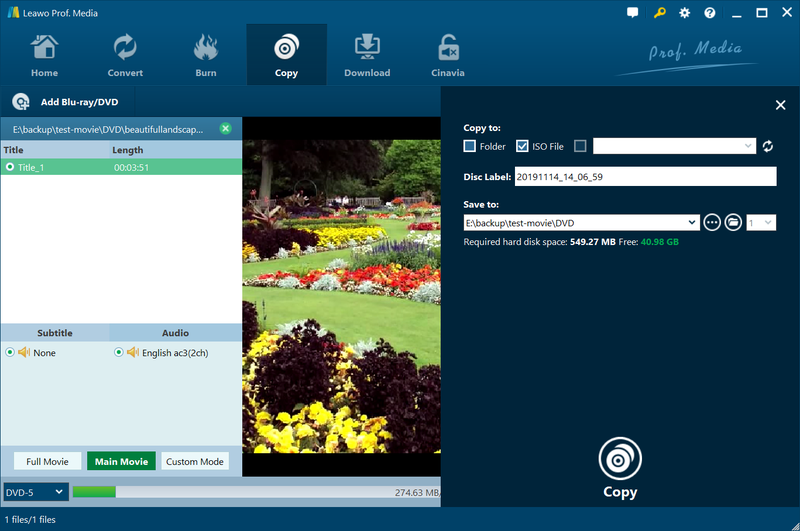 If you decided to give it a shot, there’s a high-quality piece of Blu-ray copy software you can use called Leawo Blu-ray Copy. It has all the features you need for making a region free Blu-ray disc. It can copy a Blu-ray disc directly to another disc with no quality loss and remove the region code during the copying process. What you get from it is a copy that’s exactly the same as the original disc only without the region code on it. The region free copy can be played on Blu-ray players of all regions. If you intend to give this a shot, download and install the program on your computer and follow the instructions below. ☉ Copies Blu-ray/DVD disc with no quality loss. Note: Leawo Blu-ray Copy was incorporated in a software package called Leawo Prof.Media a few years ago. As is mentioned previously, you can directly copy a Blu-ray disc to another disc. If you only have one Blu-ray drive to use but still want to create a new disc, it can also be easily managed with Leawo Blu-ray Copy. The detailed process will be shown in the content below. Step 1. Start Leawo Prof.Media from your desktop. 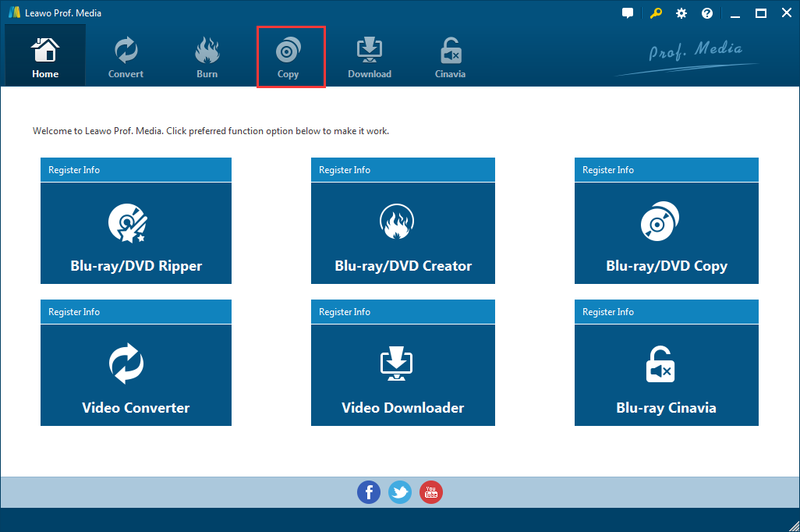 After finishing the registration process, click the Blu-ray Copy shortcut key from the main interface of Prof.Media to load Blu-ray Copy. Step 2. 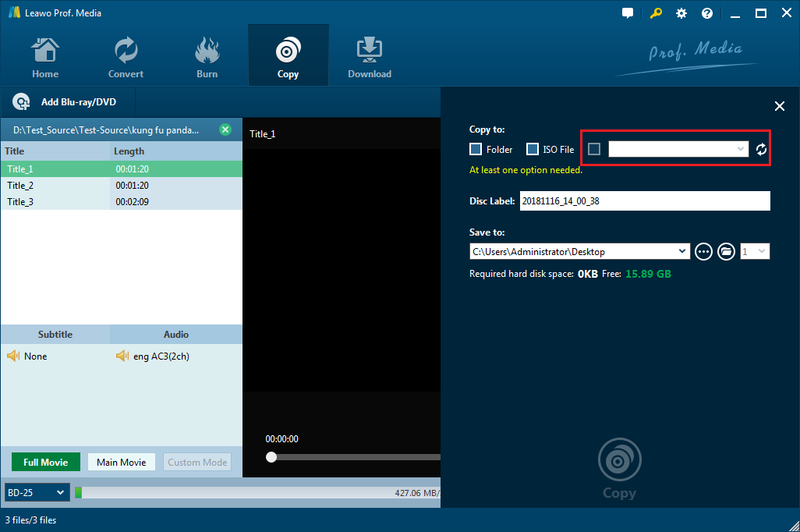 If the original Blu-ray disc is already in your Blu-ray drive, then you can directly start off by adding the data in the disc to the program. Just click the Add Blu-ray/DVD button from the upper-left and choose Add from CD-ROM from the following menu. Then you will see the option for loading your disc to the program. Step 3. After the disc is properly imported to the program, you will have 3 options for deciding what content in the disc to copy. On the left side of the current interface you will see several different elements. There’s the video titles list, audio track list and subtitles list taking up most of the space of the left sidebar. You can pick a video to play on the right side and select the subtitles and audio tracks you need from the respective lists. There are 3 buttons below the said lists: Full Movie, Main Movie and Custom Mode. They are used to select different content in the copy to include in the copy. To keep all data in the copy, choose Full Movie. The Main Movie button is to help users select the main movie from the video list to keep in the copy. Custom Mode is, like what the name suggests, for you to customize and choose what you want to keep in the copy. After choosing a copy mode, you will also need to select a disc format for the copy by clicking the button below the 3 copy mode buttons. If you want to make a 1:1 lossless copy, you should probably choose a format that’s the same as the original disc. But if you are copying a BD50 disc but the blank disc you use is BD25, the program can also compress BD50 to BD25 for you. Step 4. Click the Copy button from the upper-right of the program and the program will display a sidebar on the right side. Check out the three options on the top: Folder, ISO file and a drop-down box. If you have another Blu-ray drive connected to your computer with a blank disc in it, you can select it from the drop-down menu by checking the third option. If the Blu-ray drive you are using is the only drive you have, check the first or second option to save the copy to your hard drive first. After selecting the first or second option, or both, set the output directory for them in the box under Save to. And you can start the copying process by hitting the Copy button on the sidebar. If you have two Blu-ray drive(one of them must be a Blu-ray burner in order to create a new copy), by the time the copying process is finished, you will have a new disc ready to play. If you choose to save the copy to your computer first, below is how to burn the copy to a blank disc with the program. The process is basically the same as above but I’ll walk you through it again. 1. Launch Blu-ray Copy again and click the Add Blu-ray/DVD button. And then select either Add from Folder or Add iso file according to your choice from above. 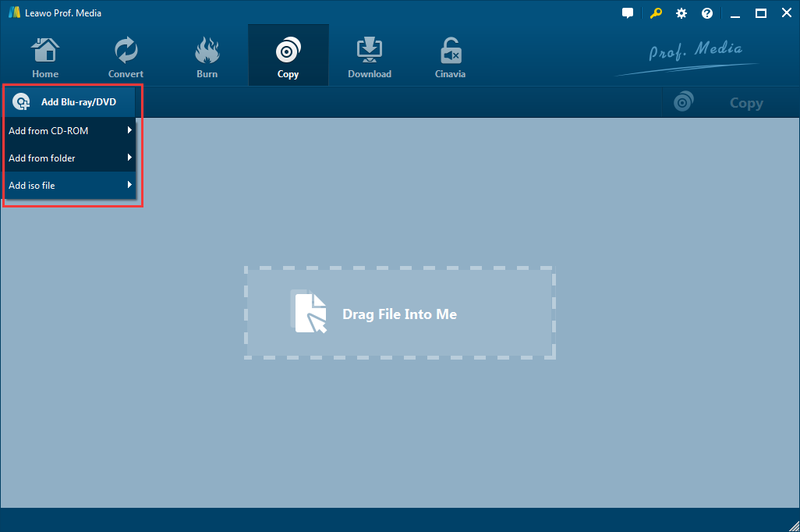 You can also directly drag the Blu-ray folder or ISO file you get from above to the program to import them. 2. You will see the same interface as the one you see from Step 3. This time you can directly select Full Movie. Also, you will have to select the disc format again. 3. Click the Copy button again to display the sidebar. Check the third option and select your disc drive from the drop-down menu. And then click the Copy button to start burning the copy to the disc. Below is the video guide of Leawo Blu-ray Copy that will walk you through the Blu-ray disc copying process. If you don’t own a region free Blu-ray player, this would be an effective solution to your region code issue and is worth a shot.